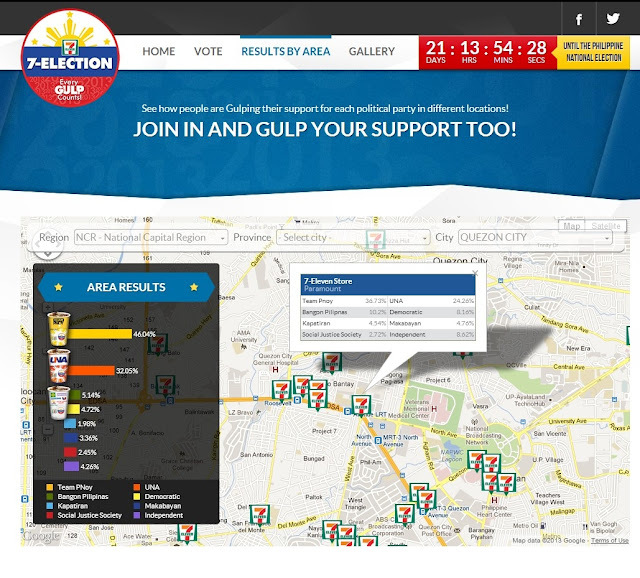 Every Gulp Counts at 7-Election! It's election time once again, and while we count down the days to May 13, why not study first who you're voting for and voice it out via 7-Election! Wait, you don't know what's 7-Election? 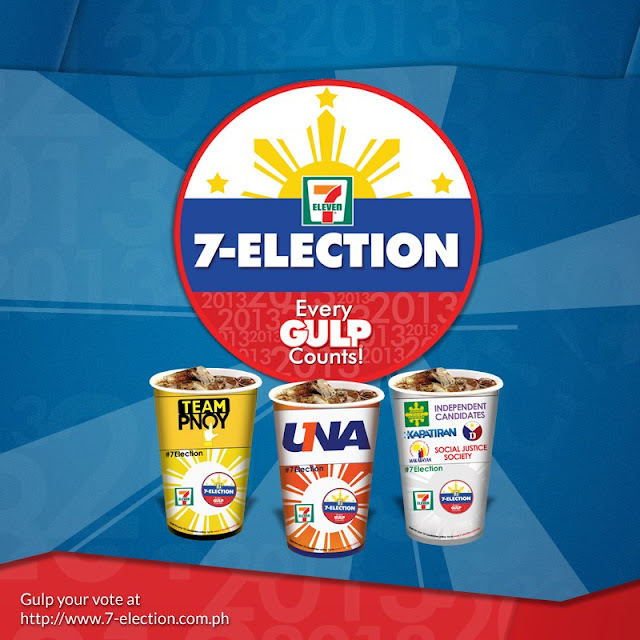 7-Election is 7-Eleven's fun way to get the pulse of the people in the upcoming elections via their Gulp® cups. Customers may vote by purchasing any 16oz Gulp® beverage (from the selection Coke, Pepsi or Del Monte Gulp® drinks) featuring the three designs of the different senatorial coalitions. I dropped by 7-Eleven Paramount branch and checked out the 7-Election first hand. Each 7-Eleven branch has one of these tally boards showing the leading candidates in their store, as well as overall leaders for all the branches nationwide, this list is updated weekly. People who wishes to participate just need to go to the Gulp® drinks area of their favorite 7-Eleven branch, choose from the cups, fill it up with the drink they like, and pay at the cashier. Customer filling up their chosen cups with their refreshing Gulp® drinks! 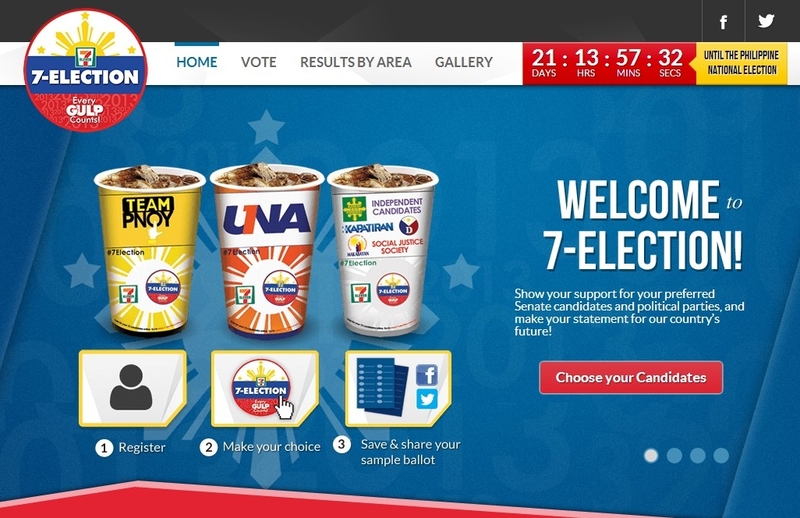 There are 3 available cup designs to choose from; yellow cup representing Team PNoy, Orange cup representing United Nationalist Alliance (UNA) and the white cup for independent candidates as well as smaller parties such as Ang Kapatiran, Bangon Muna, Democratic, Makabayan and Social Justice. If you're wondering how do they tally the cup votes, well here's how each purchase of a Gulp® drink in any of the cup designs counts as a vote for the respective parties. There are barcodes in each cup which reflects a vote for that party. As for the white cup featuring multiple parties, the barcode for the party of the customer’s choice will be scanned to accurately reflect the vote just like those for the UNA and PNOY cups. Aside from the store activities, you can also vote for your favorite candidates via 7-election.com.ph by logging in via Facebook or Twitter, no purchase is need to vote online. You can also upload your photo with your chosen party on the website or check who is leading the poll in different areas via an interactive map. I checked out the Paramount branch where I dropped by to see who's leading. Voting in all 7-Eleven stores is until May 6, 2013, while the final results will be released online as well as in stores on May 7, 2013. You still have time to go to your nearest 7-Eleven branch and grab your own Gulp® cups! Don't forget to take a picture and upload it via social media with the official hashtag #7Election! DISCLAIMER: This is an unscientific and unofficial survey supported solely by the company, done in the spirit of fun, without additional questions and restrictions as to the age of the voter and frequency of votes, and hence may not be considered to reflect any sentiments regarding any official survey or any upcoming elections. This is in line with the sales promotional activity for 7-Eleven Stores’ Gulp® Products conducted from March 20 to May 6, 2013.